The ultimate veggie side dish is here! 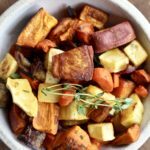 Easy Roasted Root Vegetables are the perfect compliment to almost any winter meal! Preheat the oven to 425’F and line a large baking sheet with foil. Coat pan with non-stick cooking spray. Place the vegetables in a large bowl along with the olive oil, salt and pepper and toss to coat the veggies in oil. Spread the vegetables out evenly on the prepared baking sheet. Nestle the sprigs of thyme throughout. Roast for 30 minutes, stir once, then cook for an additional 15 minutes. Remove thyme branches (the leaves should now be happily living among the veggies) and serve!